Save sekiro to get e-mail alerts and updates on your eBay Feed. Unfollow sekiro to stop getting updates on your eBay feed. Did you mean: sekio (24 items)? See more like thisSekiro: Shadows Die Twice PS4 Game. Sekiro: Shadows Die Twice Collectors Edition. PS4.New & unplayed. From Software. 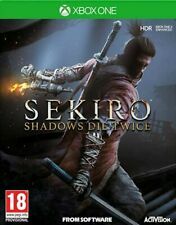 New listing Sekiro: Shadows Die Twice Playstation 4 PS4 - Steelbook edition. See more like thisSekiro: Shadows Die Twice Playstation 4 PS4 - Steelbook edition. This page was last updated: 25-Apr 11:31. Number of bids and bid amounts may be slightly out of date. See each listing for international postage options and costs.